Dealership employee turnover rates are notorious for being amongst the highest out of all retail sectors. Unfortunately, dealers have been forced to absorb the spiraling costs associated with a lack in salesperson retention, which only appears to be getting worse. NADA’s latest Workforce Study reported salesperson turnover rates are at a record high of 74% - up 7% from last year. What we don’t often talk about is the broader implications high employee turnover can have both on dealers and on the industry as a whole. Consequences of losing good salespeople can transcend beyond an individual dealership level, as any significant reduction in customer retention or customer loyalty has the potential to damage the reputation of an entire brand. Dealers aren’t shy about communicating the adverse effects high churn has on their business, both in their operational processes and when it comes down to their bottom line. Wards Auto says, “The impact is significant, causing decreased sales and profits, and diminished customer loyalty,” which we know can be detrimental to the health of any business. MAXDigital recently surveyed nearly 400 dealers in the U.S. and found 78% struggle with issues related to high staff turnover. The root of the problem is two-fold in that good salespeople aren’t just hard to keep, they’re hard to find in the first place. Ninety percent of dealers surveyed said “Hiring good salespeople is hard,” and finding candidates with previous sales experience let alone automotive sales experience is even harder. Over time, chronic retention problems add up and can cost dealers hundreds of thousands if not millions of dollars a year. A study by Driving Sales and Hireology determined the average cost of recruiting, training, and lost productivity for each salesperson is $45,000 (and that was back in 2016). In my last blog, we defined the value of a good salesperson over the course of one year to be more than $325,000 in pure gross profit. Add that to the cost of recruiting and training and dealers are losing out on over $365,000 per salesperson, per year. The need for dealers to be able to identify their best salespeople in order to retain them is more critical now than ever before. Why? Because people still heavily rely on face-to-face, personal interaction - especially when it comes to making big purchase decisions. The larger the purchase, the more inclined customers are to buy from someone they trust. Despite the abundance of online vehicle research tools at their disposal at any given micro-moment, relationships will always take precedence. And people naturally gravitate towards both consistency and what is familiar to them. They’re also much more likely to buy a second and a third car from the same person they already know and trust. When it comes to evaluating the true performance of your salespeople, having the ability to view CRM data through a scientific lens is essential. CRM companies do what they do very well, but they only show one dimension of a highly multidimensional story – the wins. But what about the leads your salespeople touched that defected? Without that defection data, it becomes near impossible to properly identify the best performers on your team based on the opportunities they’re working. In order to see who the real winners and losers are representing your dealership, you need a way to visually compare the number of leads each person sold each month in addition to the ones they lost and who they lost them to. Only then can you see who is really the most effective or ineffective because you have the complete story. You can make much better decisions on who or what needs to change based on a real visual of what you’re losing. What we’ve never seen before at the dealership level, is science taking a leading role in how we evaluate our sales staff. If science-based technologies can tell you the people that consistently prove to be growing in a positive direction, or reducing their defection rates over time, then science can play a role in helping dealers implement compensation plans that serve and reward only their best people. Keep in mind, it’s important to give newer technologies or data-driven solutions time to build, learn and improve. The more sales and defection data we can collect over time, the more accurate and actionable the tools that leverage this data will be at identifying your best (and worst) employees. I’ve been in this business for 27 years. If there is one thing I know without a shadow of a doubt, it’s that the chances of a salesperson closing a sale are greatest when the customer is physically in front of them. So, in addition to leveraging the right technology to evaluate your staff, leverage technology that will support what we know to be the greatest strength of any person that knows how to sell a car… get the customer in the showroom. The takeaway here is to place a heavier focus on solutions that are proven to get people physically in the door, where you have a much higher chance of getting them behind the wheel for a test drive, building a personal relationship, selling them a car, and retaining their business. Test drive incentives are one tactic we know works. Pair that with a bulletproof lead follow-up process and what you’re left with is a prescription for lowering defections tied to your salespeople, higher close rates, and better-rewarded, happier employees. In summary, everyone wants to retain salespeople and everyone wants to retain the right salespeople for their respective business. So many dealership compensation plans are set up to benefit the underperformers – which is completely counterintuitive to reducing turnover. Until now, it’s been impossible for dealers to adequately compensate their all-stars and overperformers because they’ve had no way to identify them. Moving forward, dealers can take this information and adjust their compensation plans to retain the right salespeople and make the necessary changes to get rid of the rest. After all, it would only make sense to reward the people that are rewarding you. Morrie’s Brooklyn Park Nissan wanted to prove a particular lead provider was consistently delivering high defecting leads to their showroom. They needed a way to validate their decision to cancel this service by showing incremental improvement in their sales operations after removing the lead source from their marketing mix. AutoHook's Traffic Conversion Analysis (TCA) validated their suspicions and then some. Not only did they see a 61% average increase in salesperson performance after removing the lead source, but they were able to free up 40 man-hours a week and reallocate that budget towards their bottom line. TCA didn't stop there. The solution helped the Morrie's Brooklyn Park Nissan see a significant improvement in their operations based on where they were losing the most sales, leading to a 50% reduction in defections to their #1 competitor. See the complete set of results and how we did it. Click below to read the complete case study! What's the REAL Cost of a Bad Salesperson? If you think good salespeople are expensive, try bad salespeople. In 2017 alone, dealership employee wages totaled over $66 billion and “auto retail continues to boast one of the highest average salaries of any industry,” according to NADA’s annual report. Combine infamously high turnover rates with a decently-compensated workforce, and I’d argue the ACTUAL cost of a bad salesperson in the car business is a lot more than you think. As someone who spent my first seven years at a dealership on the selling floor, I was always frustrated when it seemed like our comp plans served the worst salespeople, not the best ones. To attach a dollar amount to what a bad salesperson could be costing your dealership, we first have to define the value of a good salesperson by doing some simple math. According to Automotive News, last year’s average retail gross profit per new vehicle sold was just over $2,000. Let’s call it $1,500 to be on the conservative side. So, a good salesperson selling 15 cars a month at an average gross profit of $1,500 a car is generating $22,500 in gross profit a month for your dealership, or $270,000 a year. A salesperson selling 15 new cars a month equates to 180 customers a year. Then you have to factor in the lifecycle of the vehicle and the potential service revenue associated. Let’s say out of those 180 customers, half of them serviced with you. And, of those 90, each returned for service five times over the car’s lifespan. That’s a total of 450 service visits. According to Urban Science, the cost of an average service RO is $128.88. Do the math, then add it to the gross profit and you get $327,996. (My math is below for anyone in question). So in reality, for a year’s worth of customers, we’re talking a value of over $325,000. That number sets the stage for what a bad salesperson could be costing you – because you can apply the same logic to 15 lost sales, or defections to competing dealers. If you have someone you think is one of your top performers selling 15 cars a month, but they lost 20 quality opportunities, that’s the equivalent of $30,000 a month, or $360,000 a year in LOST profit. Are you willing to lose a third of a million dollars from employing just one faulty salesperson? If that cost isn’t enough for concern, there’s also the fact that there could be multiple people under your rooftop disguised as your “best” performers. But when you overlay all the opportunities they touched that we know defected – or purchased from a competitor – on top of what they sold, the story shifts and their actual sales effectiveness comes into focus. The takeaway here is it’s not just about the 20 cars you could have sold. It’s about the dollars attached to those sales and the potential future profit in service revenue and repeat buyers. We all know the closing ratio on a customer is higher if they’ve already purchased from you. Selling a second and third car to someone who already knows and trusts you is a lot easier than selling the first. It becomes easy to watch the total worth of a single good salesperson exponentially expand when you know their number of closed opportunities consistently exceeds what they’re losing – but you need that defection data to get the REAL story. As it turns out, what you don’t know about your salespeople can hurt you. I am not sure why, but we don’t often associate analytical tools as the best way to measure the performance of the people we hire to connect with our customers and build lasting relationships. I’m a common sense guy, so if my staff is hitting their numbers and selling cars, there’s really no reason for concern or to take a deeper dive into the opportunities they’re working…right? Not necessarily. What I’ve come to accept over the last few years is that when good data is presented in a way we can easily understand, it has a tendency to challenge everything we “think” we know about selling cars. Too many of us think that we are the “Presidents of the I Think Club.” I learned that from one of the truly smart guys in the car business, Gary Marcotte, over 10 years ago and I've never forgotten it. Dealers have always been able to see their close rates, or how many opportunities each salesperson successfully converted into a vehicle sold. But there is an entire other half (or I could argue 2/3) of the story they haven’t been getting – and that’s how many opportunities they didn’t close and purchased a car from someone else – or in other words, their defection rate. When you layer in data that shows defection rates to competing dealers or brands in your market, it gives life to a story we’ve not only never been able to see before, but one we never even thought to look at before. I sold cars for seven years, spent years as a sales manager, then the General Manager of a dealership and I eventually became the CMO of large dealer group with 1,100 salespeople to account for. It would have been impossible to analyze every opportunity every person in our organization touched – so the first time I saw this data in action I was blown away. Take a look at the graph below. The blue line shows how many cars each individual sold during this 3-month time frame. The gray lines show you the number of opportunities that salesperson touched that went on to buy from someone else – whether it was a same make competitor in your market (light gray) or from a competing brand (dark gray). In this example, this dealership thought that John was one of their best salespeople. But when you look at your CRM data with a 3-dimensional lens and layer that lost sale (defection) data on top of it, you start to see the true story behind your “all-star” players. You see how many opportunities John touched that went on to purchase from your competitor down the street or from a different brand entirely. In reality, Jordan is this dealer’s best salesperson. Based on the opportunities he was working, he sold substantially more than he lost. In fact, out of everyone, he lost the least amount of opportunities. So success doesn’t always translate to selling more cars than you did last month. It can also mean losing fewer opportunities to competitors. Here’s another example. The screen shot below shows the actual effectiveness of a salesperson as they compare to the dealership overall. So in this case, Jim may only be selling 8 cars a month, but because he’s not getting all the opportunities, his effectiveness is 149% - meaning he’s outperforming based on the leads he’s getting. Bill on the other hand might be getting way too many opportunities and he might look like one of your best sales people, but he’s really only about 47% effective towards closing everything he touches. Your best salespeople are the ones who consistently deliver HIGH close rates and LOW defection rates. But you need that defection data to see who your real winners and losers are. Think about it like this, a pitcher that has a lot of saves, but has equally if not more blown saves, doesn’t really help the team. Or if a starting pitcher has 10 wins but has 14 losses, is he really a great pitcher? If you only looked at saves or wins, you might think so but when you can see everything at once, the story changes. This is the same sort of comparison. Keep in mind that if a salesperson has a high defection rate, it may not always be their fault. Maybe they’re being assigned far too many leads than any one person is capable of handling. Or the types of leads they’re working come from providers with low overall close rates. There are all these other factors involved. But those are topics for a different day. If dealers look at their business through this new lens, they will start seeing trends of opportunity and loss that they can’t see by just looking at their own data and what happens within the four walls of their dealership. In order to determine true success or failure you also need to look at the sales effectiveness outside of your dealership. Could it be possible that the secret to selling cars in today’s multi-touch, exponentially data-driven society is exactly the same as it was prior to World War II? I know what you’re thinking. This is either a huge stretch or some sort of joke. However, recently uncovered sales training documents dating back to 1939 tell a very unexpected story that directly parallels the fundamental methods dealers need to sell more cars today. In one sentence from a 219-page book from 78 years ago, we can derive three secrets to selling cars that remain true today. Not only are these tactics relevant to the way dealers currently operate, but they are also the difference between a dealership that’s running successfully and efficiently and a dealership on the verge of failure. Below are the three operational insights that have endured in this industry throughout generations, wars, and the age of the Internet that changed everything as we know it… or did it? These takeaways will continue to be the foundation of how to sell cars in 2017 and into the future. The number of people buying competitive cars that your own dealership has been in contact with. The reasons or sources responsible for these lost opportunities. The reasons why a local competitor may own more market share than you do. This is so interesting to me because these are things GM recognized back in 1939 and STILL today we struggle with being able to put our finger on the number of opportunities we lose each month and the sources (or people) responsible for these losses. A sales manager that concerns themselves with not just their own dealership’s performance but also the performance of their top competitors and defection rates to other dealers or brands is a sales manager with A LOT of common sense! If a customer is walking into your store, interacting with your staff, and leaving to purchase a vehicle from somewhere else, there’s always a story to uncover as to why. The problem in the digital world we live in is that dealers lack visibility into all the different sources, touchpoints, and online or in-person interactions that may have played a roll in a lost sale. You can only see the leads that come into your dealership. You only see the opportunities you’re working. Ultimately when leads get to your DMS you can see sales, but what you don’t see is the customers that defected and who they bought from. You don’t see the dealership next door and what is in their CRM and you CERTAINLY can’t see what’s in their DMS, and that’s a HUGE blind spot. Because of the fact that no two dealers are the same and no two markets are the same, there will always be a different sickness, prescription, and remedy for each and every dealership. If you have a clear view into the ailments in your processes associated with each lost sale, you can then derive the information you need to make beneficial changes to reduce your rate of defection both to other brands or other same make dealers in your market. Identifying the number of lost sales opportunities in your CRM is just the first step. The second is integrating technology that exposes where the problems are in your sales processes. Maybe it’s a third party lead provider with a high close rate and a high defection rate - meaning you need to go after leads from that particular source more aggressively or put more marketing dollars towards those leads to reduce the defection rate. Or maybe you have a salesperson with a high close rate and a low defection rate that should be handling more opportunities. Maybe you have high defection rates tied to a particular model in your inventory, so you then know it would be a good idea to increase incentive offers around that vehicle. Most vendors and digital advertisers only provide a one-sided perspective of your data, which is why big data has been so limiting at the dealership level. Dealers know they’re losing sales, but they don’t know where, to who, or why. If you can see the full picture, you can then start to put together the pieces of the puzzle around whether or not you had the right inventory, or did you have the right selling strategy against your competitors, and who are you truly competing with? The obscure, blurry picture of your market’s sales trends starts coming into focus. So in summary, what we need to do is start incorporating that 1939 mentality back into the way we operate. The greatest marketing trends of all time began as insignificant ideas that eventually gained enough momentum to reach a critical tipping point – the point in which uncharted tools and technologies once overlooked by the masses are adopted by the mainstream. When ideas reach their tipping point, an infectious, unstoppable domino effect goes into play. The undiscovered becomes discovered, the unfamiliar becomes familiar, and the unknown becomes universal truth. Just as the adoption of CRMs exploded in the early 2000’s and mobile marketing reached its tipping point circa 2014-2015, I believe big data has reached its culmination in 2017. I know this because I’ve seen the distinct black and white clarity today’s automotive data has finally been able to give to car dealers. True successes, failures, and trends tied to each salesperson, lead or traffic source, inventory, day of the month, zip code, etc. What we know now is that all of the items listed above are finally within reach. It’s also important to note that the problem has never been the data. It’s that dealers have only been able to view sales trends within their own CRM and DMS. How can you possibly improve your sales effectiveness if you’re only comparing it to yourself? The inability to see the sales and defection trends of top competing dealers and brands in your market has been a HUGE roadblock for dealers... until now that is. 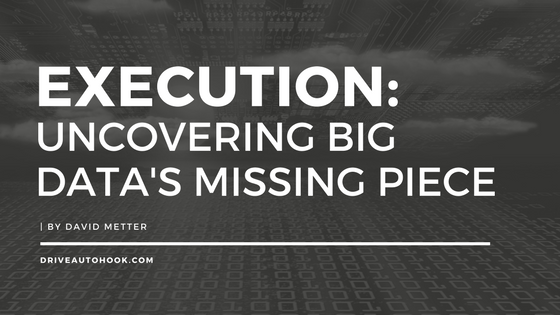 Today’s big data landscape has evolved to become 100% executable. We can quickly gain insights from data using a scientific approach that exposes lost sales by source at an aggregate level. By knowing your lost sales opportunities, who you lost them to, and where you lost them, a strategic path towards increasing sales and reducing defection rates naturally comes into view – despite what your market conditions may look like. We can even take it a step further and look at success and defection trends tied to an individual person within your sales staff. For example, if someone has a high close rate AND a high defection rate, you can break down where these lost opportunities are coming from. You can see that person is being assigned way too many leads and then you can make smarter decisions in terms of how you divide up your employees’ responsibilities. When you can see where you’re losing sales across the board, you can then align your conversion goals, the operational training of your staff, and the way you drive traffic and leads into your dealership – so you can have the highest quality lineup of opportunities to close. The advent of integrating automotive data to make more profitable operational decisions is similar in many ways to when CRM and DMS technologies were first implemented. Using these tools gave you a way to organize and streamline your process to help you sell more cars. The ability to execute smarter sales strategies using data analysis is no longer alchemy. It’s the current reality of this instant gratification world we live in, and it’s the weapon dealers need to be unstoppable. AutoHook, the automotive industry’s frontrunner at proving sales, showroom visits, and the ROI of their private incentive offers officially released their latest dealership report, Traffic Conversion Analysis (TCA). 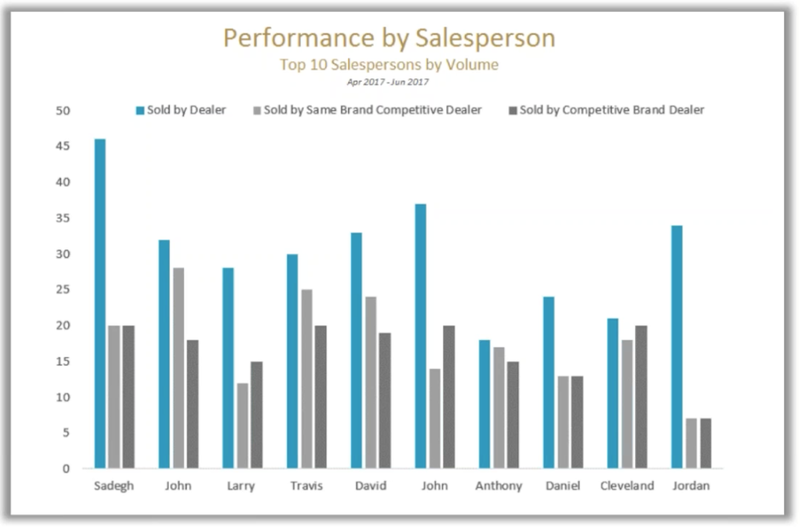 TCA, powered by near real-time sales match data from Urban Science gives dealers an entirely new perspective of their sales operations as well as defection trends to competing stores or brands in their market. AutoHook’s TCA is the first-ever report to deliver a complete, 360-degree analysis of a dealership’s CRM leads, exposing their greatest areas of lost sales opportunities tied to a specific competitor, salesperson, zip code, model, lead source, traffic source, or time frame. Using insights derived from TCA, dealers will have full control over their marketing, lead conversion, and operational processes. The report is revolutionary in that it allows dealers to identify detailed lost opportunities tied to an individual salesperson, using data only hours old. TCA matches a dealer’s existing CRM and DMS data with Urban Science’s near real-time sales database to reveal the sources responsible for the highest defection rates. AutoHook’s technology also identifies leads that have already purchased a vehicle elsewhere, thus helping reduce wasted time and marketing efforts chasing customers that are no longer in market for a car. TCA’s multidimensional reporting pinpoints missed opportunities and AutoHook then provides the solutions necessary to transform them into showroom visits and closed sales. Based on the insights revealed within TCA, AutoHook implements customized incentive campaigns to target the areas and sources with the highest defection rates. “We don’t just show dealers all the problems within their operations and send them on their way, we actually prescribe the solutions necessary to cure these issues and execute full-circle with our private incentive offers,” adds Metter. TCA uses the fastest most accurate sales data available to uncover a narrative dealers have never been able to hear or see before. The value of this knowledge will result in more efficient strategies to increase market share growth even in declining conditions. AutoHook, powered by Urban Science specializes in proving sales attribution combined with an untouched ability to deliver showroom visits that purchase. Through their network of private incentive offers, AutoHook supplies true, incremental walk-in traffic for dealers and OEMs. Powered by Urban Science's sales match database, AutoHook instantly proves their ROI with the fastest, most accurate sales validation data in existence. AutoHook's incentive solutions are scientifically proven to lift incremental sales, new to brand buyers, showroom visits, and conversion rates across channels. For more information, please visit DriveAutoHook.com/TCA or call (855) 532-3274.